Will Cadell isn’t the kind of person who was born thinking he would start a business of his own. But when Cadell was 32, he gave up paid employment doing mapping for the forest industry to become a freelancer providing the same kinds of services to multiple clients. 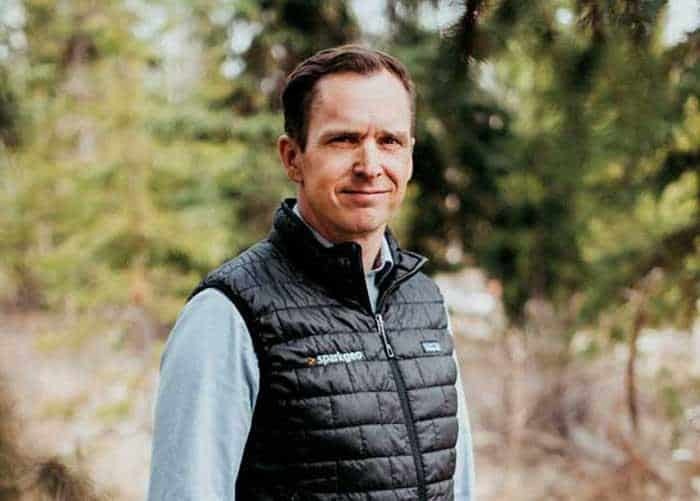 Seven years later, he has a thriving web-mapping company in Prince George called Sparkgeo, 20 employees across the country and a constantly evolving strategy for where he wants to go with his team and his business. And even though it’s a long way away and may never fully arrive for a “fidgety” person like him, Cadell, a Scotsman who moved to Canada after finishing university, also has a plan for retirement. Some of it is standard Canadian, like putting money into RRSPs. But for Cadell, it also means developing a business that no longer requires his presence. So he’s constantly hunting for products his company can create that will live on their own. He has one already, Maptiks, a market-intelligence tool that allows businesses to track what their customers are looking at as those customers interact with an online map that, for instance, shows real estate for sale. Cadell and his staff are trying to create more, while continuing to do the kind of individualized consulting he started his business with. As it turns out, Cadell, without relying on the services of a business coach, lawyer or investment manager to come up with that approach, is doing exactly what those experts say small-business owners should do. Business owners need to do some of the same things that any adult in Canada would to prepare for the future. Spend less than they make. Put money away in both specialized retirement and non-retirement investment accounts. Calculate what pensions they will get from government or a private company, if any. Understand what their current living expenses are and calculate what their future ones might be for the years left to them on the actuarial tables. But their retirements—if and when they arrive at that point, with business owners being congenitally more inclined to keep working past 65—are complicated by other factors. They need to plan to sell or transition out of their business, and when they do it, they need a tax strategy to maximize the profit they get to keep. But well before that, they need a tax strategy from year to year that gives them the most for the long term. They also need to truly understand what their living expenses are. That’s one of the warnings that Michael Preto hands out to his clients, along with the basic need to make the business sellable from the start: figure out how much income you’ll need to replace, especially considering that you’ve probably mixed your personal and business expenses together for decades. Cadell understands that, too. Careful to separate the two kinds of expenses, he’s set up a system to pay himself a salary and issue himself a T4 every year. “It costs more…but it’s worth it,” says Cadell, who jokes that his business brings in “between $1 million and $4 million a year” in gross revenue. It helps him ensure that any future buyer of Sparkgeo understands what the true costs are, including the founder’s wages. Hundreds of kilometres to the south, Bill Broddy is making similar moves, having learned some lessons from navigating two previous businesses and one retirement already. In his earlier life in Ontario, Broddy, 64, a former IBM Corp. employee, had run high-tech businesses, but they were primarily consulting and services companies—the kind that, as Will Cadell knows, are difficult to sell or perpetuate because they rely so much on the owner’s personality. “The company before very much was dependent on my knowledge—you couldn’t really sell it,” Broddy says. This time he’s trying something completely different: creating a new kind of food process that he hopes to franchise around the world. Broddy started Winecrush two years ago after exploring the countryside around the home he chose for his retirement in Summerland, where he noticed that local wineries were throwing away the grape skins, seeds and dregs left over after making wine. Broddy did some research and came up with the idea of creating sausages and cheeses infused with those strongly flavoured remains. It took a lot of experimenting—“you throw away a lot of test batches,” he says ruefully—but eventually he arrived at products he liked. Broddy, who runs Penticton-based Winecrush with his daughter and son-in-law, is already selling at Lower Mainland stores like Save-On-Foods and Urban Fare, as well as in Calgary and Edmonton, with about $200,000 a year in sales for 2017. But Broddy is also setting himself up for retirement in other, smaller ways. Unlike other small-business owners across Canada, who recently staged a revolution protesting tax changes that the federal Liberal government had proposed for them, he doesn’t think it’s good planning to sprinkle income among family members or use other tax strategies that reduce that income on paper. He pays himself a salary, plus the Canada Pension Plan dues on that, so he will get the maximum CPP in retirement. Of course, not every business owner takes that route. In Kelowna, Trent Kitsch, who has already created and sold one business, Saxx Apparel, which specialized in underwear for men with extra protective features, started a second in winemaking, is setting up a third in cannabis production and has a fourth in real estate development and investment, doesn’t think he’ll ever rely on anything but his own savings. As they contemplate their futures, Kitsch, Broddy and Cadell are free of one issue that dominates the business and retirement plans of many B.C. business owners. That’s the dynamics of real estate in the Lower Mainland, which can become an anchor dragging a business down or a powerful wind in its sails for entrepreneurs in this corner of the province that is home to half of B.C.’s population. Take the case of Angela Maida. As a business owner, she’s suffered the slings and arrows of property hell. Maida started and ran the hugely popular Pronto restaurant on Vancouver’s Cambie Street, a neighbourhood-friendly place that opened in 2011 and attracted a fanatically loyal following for its porchetta sandwiches, inventive pasta dishes and 1940s-era cosiness. But last year her landlord sold the building to another owner for 40 percent over the market value—a price Maida wouldn’t match—and that new owner announced he was redeveloping it. So Maida, after having spent $800,000 to upgrade a space next door three years earlier to create the attached Prontino restaurant, was out, with no compensation. 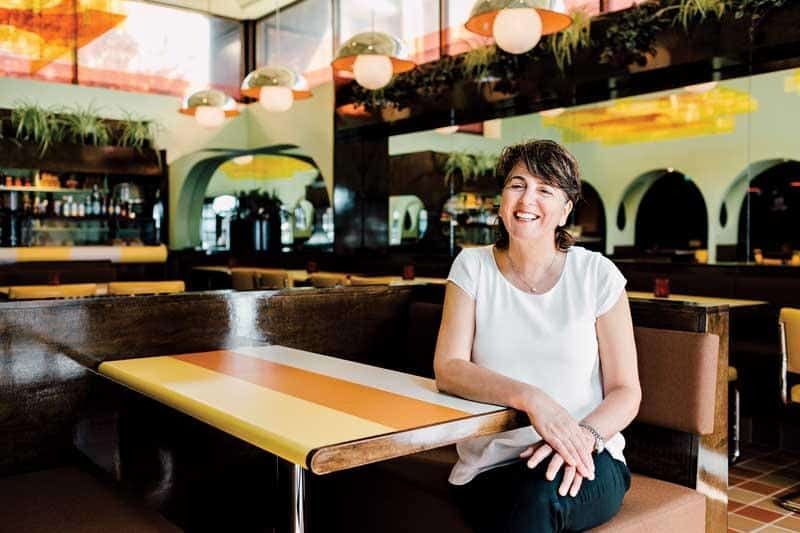 (Her mistake, she now says: “With the last lease, I should have put in a demolition clause.”) Now she’s starting again in the West End, with a similar Italian-themed, neighbourhood-focused restaurant called Centro that opened in early April. That upheaval hasn’t made retirement easier for Maida, who recently turned 56 and has been trying to move toward a life of cycling and travel. She’ll still get to what she’d been planning for earlier, backing away from her management role and letting her strong staff team handle everything after making sure the new operation is on solid ground and running smoothly. It’s a bump in the road that she was forced into by the city’s peculiar real estate frenzy. On the other hand, she’s the first to admit that she won the Vancouver lottery. “The game changer is the house,” says Maida, who lives a short walk away from her old Cambie Street restaurant. “I bought it for $500,000 in 2000, and I can sell it for $3.6 million. That is my retirement plan.” Well, that, plus a small income stream from the restaurant so, in the end, her business will also help her retire. 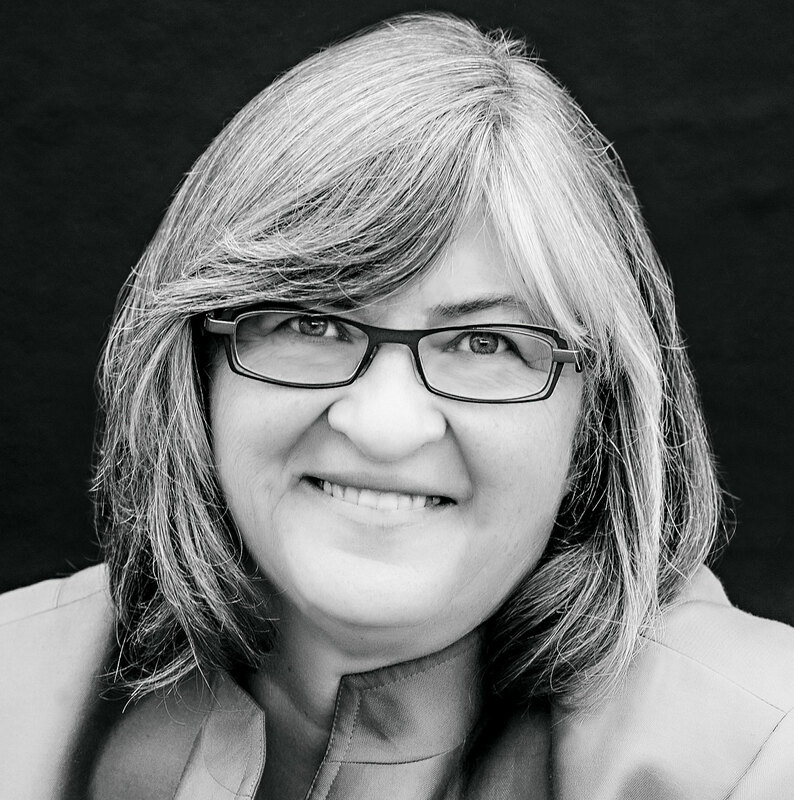 Maida’s story epitomizes the funhouse-mirror world that Lower Mainland residents live in when trying to calculate a retirement, as the price of real estate wreaks havoc with normal financial planning models. On paper (or, more realistically, pixelated spreadsheets), citizens of some B.C. communities are the most plumply cushioned people in the country when it comes to looking ahead for retirement. 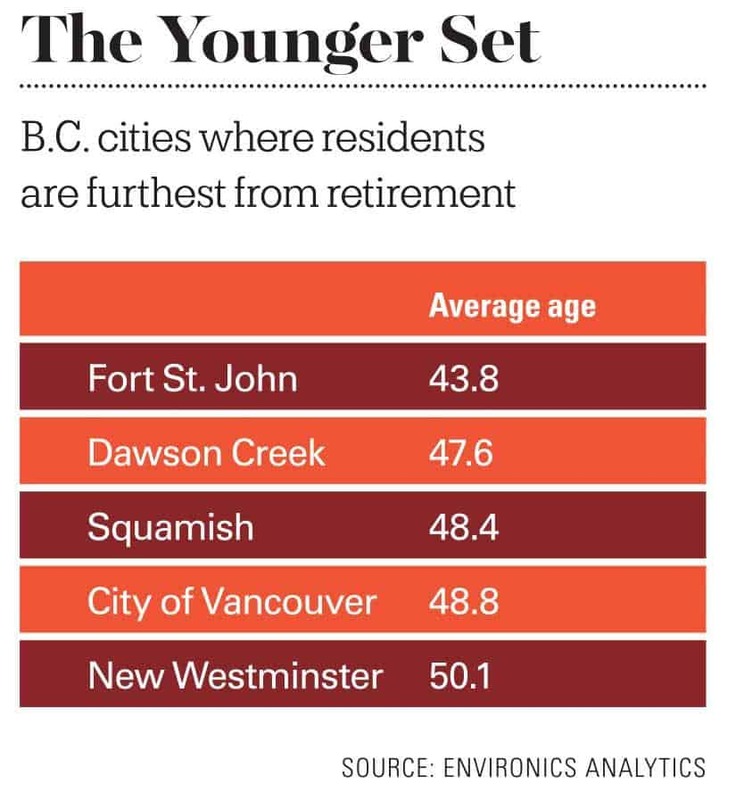 Recent numbers from BCBusiness research partner Environics Analytics show that residents of almost every city in Metro Vancouver, as well as those in Victoria, are better off than anyone else in Canada as they head toward Freedom 63.6 (the country’s average retirement age). That’s even factoring in the reality that the average resident of, say, Calgary, is younger (and therefore has more time to accumulate wealth), paid less for their house and needs to replace less income because the cost of living is lower. “The standouts are definitely in Vancouver and West Vancouver, which are above-and-beyond wealthy,” says Isanna Biglands, a research associate with Toronto-based Environics Analytics. As always, West Vancouver leads the B.C. 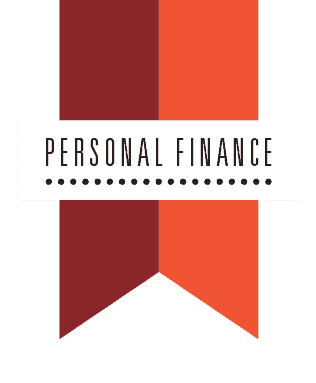 pack for financial well-being, with households there averaging $214,000 in income a year and with $4.68 million parked in their net worth column—the equivalent of 22 years’ worth of current income. But even Vancouver, despite some distinct pockets of poverty that West Van doesn’t have, is surprisingly well off. Households have an average net worth of $1.25 million, the equivalent of 13 years’ worth of their average income of $95,583. That makes them look like they’re seriously trailing West Vancouverites, but there’s one more factor. The average age of heads of household in Vancouver is only 51.4, compared to 61.5 in West Vancouver. 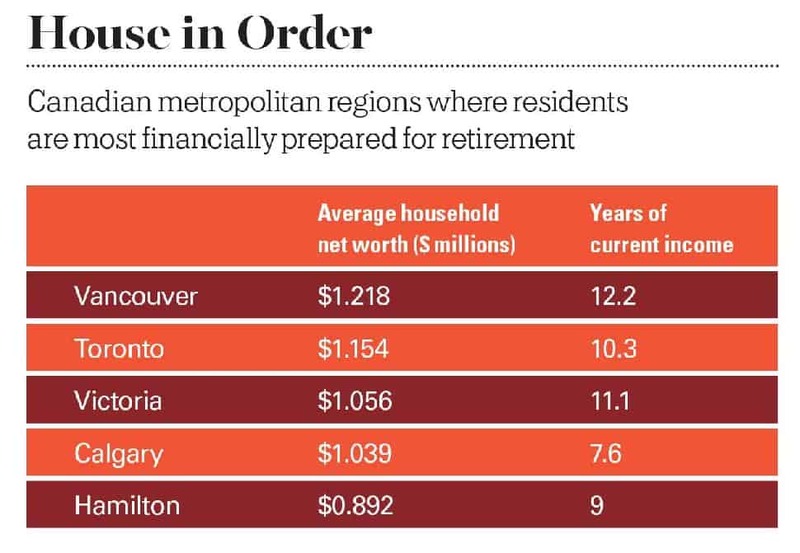 So those Vancouver households have another decade to accumulate more real estate equity, investments and cash. The B.C. real estate factor, with recent astronomical property value increases, is one that even economists don’t know quite how to assess as they analyze Canadians’ relative economic well-being. In theory, from what Milligan’s research has shown, inequality shrinks slightly in Canada once people hit retirement. Thanks to the nation’s generous set of public pensions—CPP, Old Age Security and Guaranteed Income Supplement—some of its poorest people have more money when they’re retired than they had during their earlier decades. And the wealthiest CEOs no longer have their massive salaries that put them ahead of everyone else. They have to live on their accumulated assets, just like regular folks. Those assets may be large, but they’re not the equivalent of their former salaries. “The disparity between the bottom 10 percent and the top 10 percent is less for those retired than for those working,” Milligan notes. But B.C.’s real estate gold rush has skewed that general pattern. 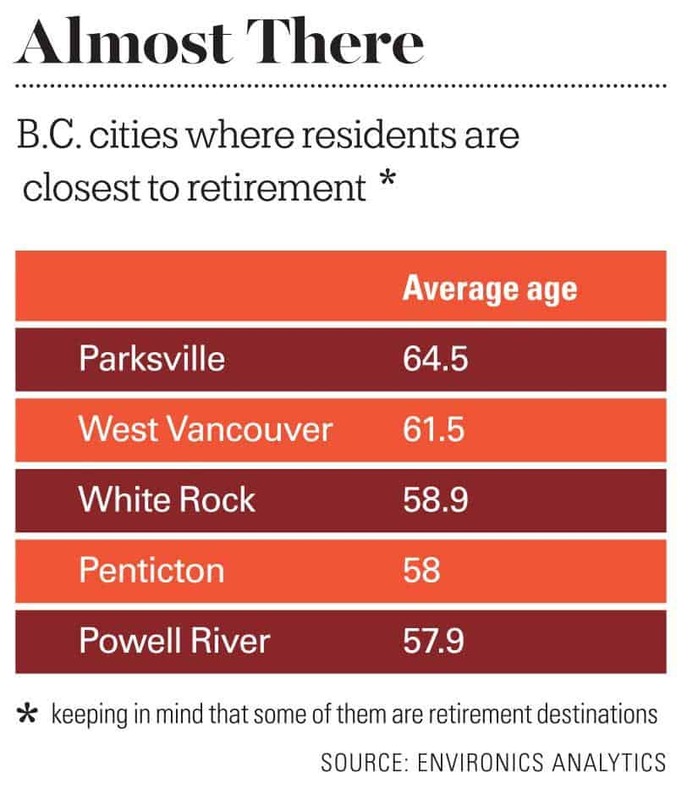 Outside Metro Vancouver or key retirement towns that Lower Mainlanders are cashing out to, the normal laws of retirement physics still apply. People in Prince Rupert, Quesnel, Terrace and Williams Lake still live like most Canadians east of the Rockies. They buy a house for a modest price, work at a job for 35-some years, accumulate a decent but not startling amount of equity, put some money aside in RRSPs and retire with reasonable but not extravagant nest eggs. In Prince Rupert, where the average age of the head of household is about same as in Vancouver, said household has only $382,000 in net worth—about four years of local salary. That’s slightly less than the average for, say, the Atlantic provinces. For the surprise millionaires in other B.C. cities, the sudden win can be dangerous. “It’s so easy to have a home worth $2 million and feel like we’re rich,” says Annie Kvick, a certified financial planner in North Vancouver with Money Coaches Canada. “We start spending more. We learn to live at a high spending level.” That can be troublesome as retirement approaches because it’s hard for people to suddenly cut back when lavish living has been a habit for years. 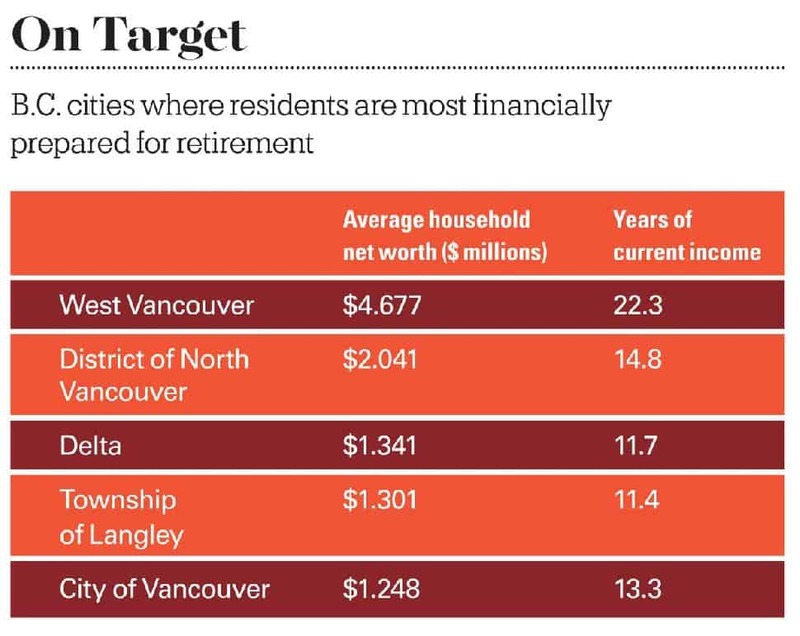 Another problem with seeing a Lower Mainland home as a retirement fund: trading in the house in Vancouver and moving to a less expensive part of the province or country is not always the option people imagine it is. For a few, with previous connections to the new place or enough income to travel back regularly to visit family in the Lower Mainland, it can work. But for many, the idea of uprooting themselves and moving somewhere they don’t know anyone isn’t that appealing. That’s especially true for business owners, who aren’t just tied to a place by people but by their business. They often shift out of work very slowly or not at all. 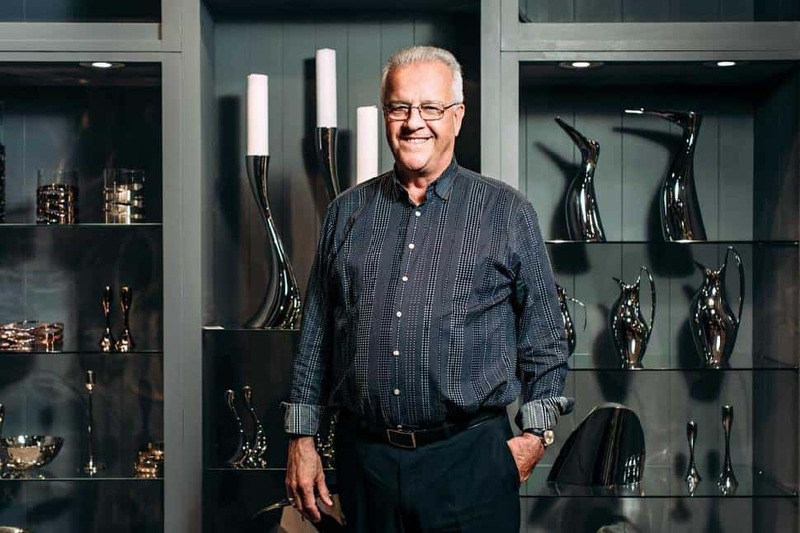 Take John Atkinson, who, at 70, still owns and works many days at the store he founded in the 1980s—the Atkinson’s on Vancouver’s Granville Street that is a mecca for fine china and housewares fiends throughout the region, as well as an online portal for American buyers. Atkinson’s three children, ranging in age from 32 to 41, all work there. His plan is to give them shares of the company eventually. But, he acknowledges, that must be done with great caution—understanding what all the financial planners say, that one of the biggest planning obstacles for entrepreneurs is the tax issues that go along with leaving a business. “When you have stuff to pass on, you’d like to just say, ‘Here you go,’ but it triggers all kinds of things,” Atkinson says. “I’ve sat down and had a couple of meetings with the tax guys already.” More meetings will follow to work out how to transition everything, someday. Atkinson doesn’t have the worries that some owners do. He and his wife, Diane, formed close relationships with many of their customers, which has helped their shop survive while 16 similar businesses in Vancouver closed during the time that Atkinson’s has been open. But their children are now taking over those relationships, reducing the kind of disruption that can happen when a new owner comes in. The Atkinsons also own the property their store sits on, which means that their business isn’t vulnerable to a landlord who decides to sell. 1. Start thinking about how to make your business attractive to a buyer from day one. 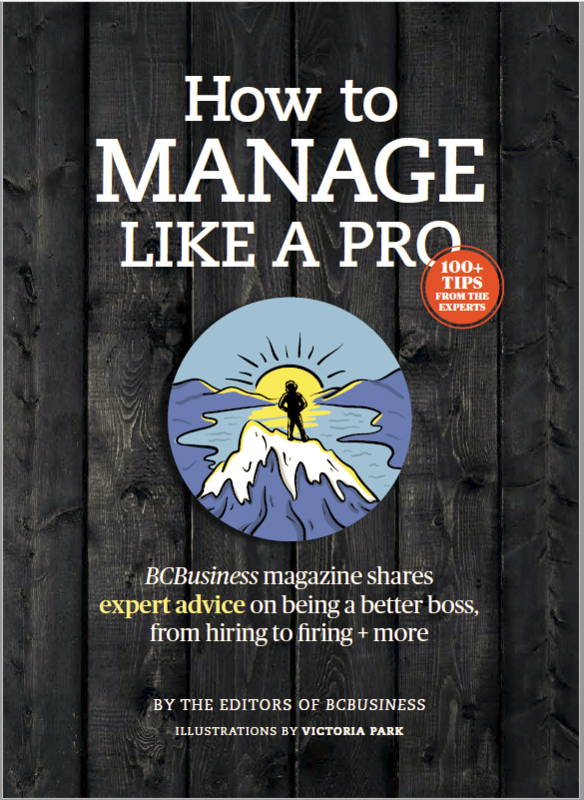 “In the tech world, their mindset is, ‘How can I get an idea operational that I can sell?’” observes Ian Burroughs, a Vancouver-based lawyer specializing in small business management and succession planning. But many others don’t think that way until it’s too late. 3. Make sure your business can operate without the current owner. “If the owner is there every day, a buyer doesn’t have confidence that they can maintain the relationships,” Vancouver-based Preto notes. 4. Separate your business and personal expenses from the beginning. If you have charged personal expenses to the business, it will be hard for you to understand what income you need to replace in retirement, Preto warns. 5. Don’t assume your business is worth millions just because you think it is. “A good succession plan will have a business valuation,” says Doug Bruce, vice-president, research, with the Canadian Federation of Independent Business in Toronto. That can mean a valuation for the ongoing business or a valuation of the pieces of it–the building, the equipment–that can be sold. 7. Do your tax planning for a sale at least three to five years in advance. Getting a giant lump sum from a sale is a tax problem. An accountant can help figure out ways to avoid that worst-case scenario. 8. Be prepared to help the buyer for a while. “A good business plan will see the owner introduce the new owner to the clients,” Bruce says.